Spike TV launched its first ever app today, where viewers can access many episodes of shows that appear on their network. The app is free and is available on the iPhone, iPad, and iPod touch. 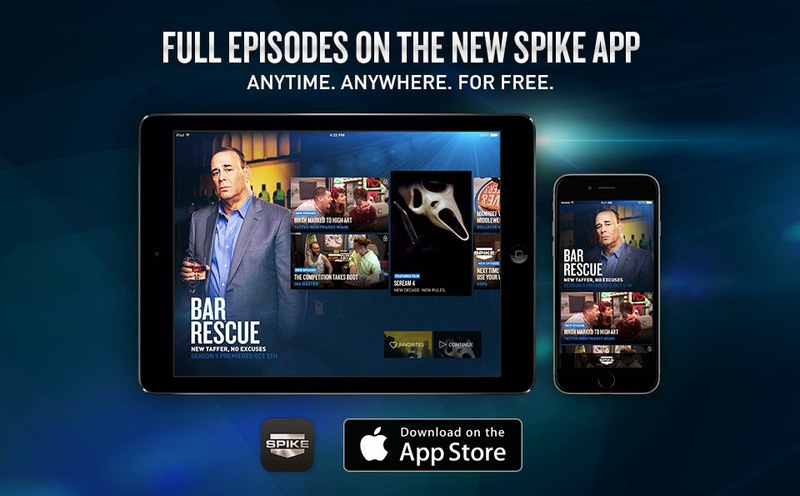 The link to download the app is here, and one of the bonuses of the app is that is has the full first episode of season 4 of Bar Rescue available to watch. So you can download the app if you are interested in watching the episode before the season starts on Sunday, October 5th. Stay tuned for the update on the first episode before it airs. *Other shows available on the app include: Ink Master, Auction Hunters, Tattoo Nightmares, Catch A Contractor, Frankenfood, Thrift Hunters, Hungry Investors, COPS, Deadliest Warrior and 1000 Ways To Die. If anybody has Time Warner cable the episode can be found in video on demand for spike channel but it isn't available in HD yet though, only standard. I watched it anyway. What about the old episodes? How come SpikeTV online doesn't provide for them? I like them better than the new ones. Oh well, onto the torrents.